Kangaroos are very social animals, and they live in groups called mobs. The overall size of it often depends on their location and the availability of food and water resources. Some mobs are seen with only a handful of Kangaroos in it. This is an indicator of a newly formed group that is just starting out. It can also be an indicator of a larger mob breaking up into smaller groups for survival. Other mobs though can end up with about 100 members in it. When that occurs they will also form subgroups within it to maintain order and social satisfaction. There is a mixture of both males and females within a mob. However, there is one male that will be dominate meaning he is in charge. He is the one that decides where the mob will go. The females within the mob are his to mate with as he chooses. In fact, that is why other males within the mob will continually try to become aggressive with him. They want to be able to mate with females. This can often lead to these males leaving a mob when they reach maturity. They usually head out on their own but other males and even some females may go along with them. Most males that do become the dominant one in a mob will only keep that position for about a year or so. They simply can’t keep up the level of physical strength and endurance to continue to fight off the other males that want that position. When that occurs the other males will force him out of the mob and he will soon die soon afterwards. Boxing is a very common type of activity that takes place among Kangaroos. This is done for a variety of reasons. Sometimes it is merely a method of playing where they get time to interact with other Kangaroos. Other times though it is for dominance in a given area. The strongest will have access to food. The most common reason for boxing though is among the males for the right to mate. 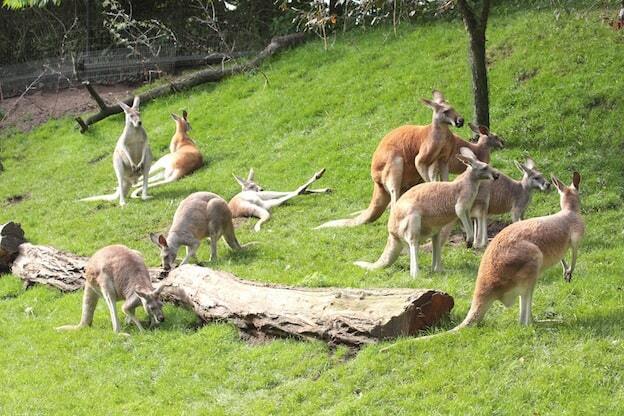 A group of kangaroos in a zoo. The females within a mob seem to form a very tight bond with each other. They show affection and caring towards each other. They have even been known to take over care for joeys when a mother is dies. They definitely don’t have the same level of aggression towards each other as the males in a mob display. The overall social structure of Kangaroos is one that is very fascinating. There are plenty of documentaries out there that cover this particular subject. If you are interested in this element of them consider viewing them. This can give you an inside look at the world of Kangaroos and what goes on with them on a daily basis. However, it is also very important to note that there are many elements of the Kangaroo social structure that aren’t well know yet. Even though many people would love to do more research, it can be time consuming and very expensive. Getting the funding for such research isn’t very simple at all. In fact, there can be lots of red tape involved when it comes to such a project. The other element that makes it difficult is that the particular social structure can actually be very different for the various species. There isn’t a set overall structure that they all follow. In fact, if you have a solid interest in a particular species of kangaroo then you will want to follow up in this department. Explore the information that is out there regarding them and their particular social interactions.